What does stagnation look like? From FRED, a graph of four big, rich countries. 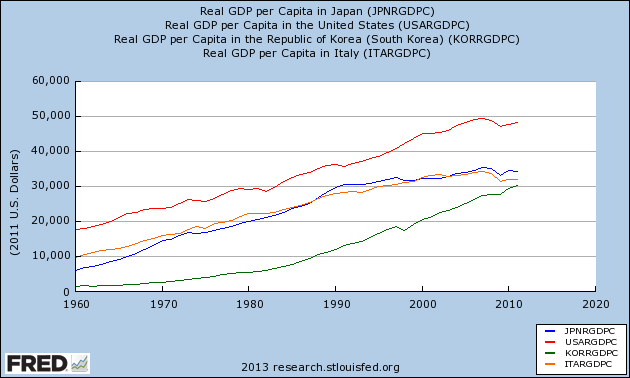 Notice how Japan and Italy utterly stagnated starting in the early 1990s. By 2012 GDP was only about 10% higher after twenty years! By contrast, GDP per capita in the U.S. rose by about 50% over the same time period, and GDP per capita rose by more than 100% in Korea. The big question now is whether the U.S. on the cusp of 2014 is entering a Japitaly twenty-year slow growth period. And the two of the usual suspects of slow growth in those two countries are present in the U.S.: (1) an aging population, and (2) fiscal and monetary dysfunction (despite the goodwill of Yellen and Bernanke, why would anyone think the Fed will not be “captured” by the big financial institutions it works hand in glove with, and whose personnel rotates in and out of the Fed?… oh right, “this is America and we don’t do that…”). Unlike Japitaly, though, the U.S. has very flexible labor, stakeholders, managers, entrepreneurs… so lots of room for the creative destruction that might be associated with innovation.